There were two “exposures” on a single frame of film for this light painting image. 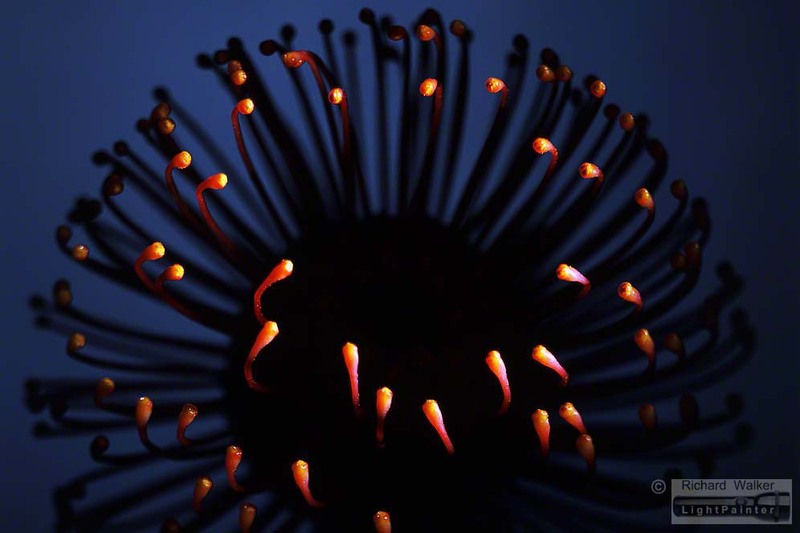 The dark blue background was exposed for 35 seconds, then a narrow beam of light was skimmed across the top of the flower for 15 seconds to produce this dramatic effect. Shot on 120 Fujifilm Velvia. I’m here to confess. I have seen “the light” — and it’s beautiful! There are few things more exciting and spontaneous than creating a photograph from the inside out. That’s what happens in light painting and that’s why I became a convert. Light painting is a relatively recent attraction for me. I began my working life in 1970 as a photographer at a country television station. In 1977, after I had moved to Sydney, I became a director of television documentaries for a national broadcaster. For the next 20 years I was immersed in a world of 16mm film, but I also enjoyed getting away from television production, pursuing my own 35mm still photography. In 1998 I made a decision that was going to affect the rest of my life. I decided I wanted to become a great photographer of flowers! At the time I had no idea about the rich legacy of flower photographers that had preceded me, so I was very naïve about my prospects or influence. This story is about how I came to that momentous decision. In September 1998, in our garden in Sydney, a bed of columbines (aquilegia) was flowering. It was the first time my wife and I had grown these delicate flowers so I decided to photograph them as a record. On a sunny day I set up my camera and macro lens and as I framed a close-up of a columbine I realised there was no illumination inside the flower bell. I decided to experiment with additional lighting. I tried leaning a small hand mirror at ground level to reflect sunlight into the flower bell. But the mirror was difficult to align and the sun moved. So I set up a small flash unit on the ground and aimed it at the flower. I tried different exposures using this fill-in flash and then rushed the film off to the lab. The resulting prints fascinated me. Directing light into the interior of the flower had made a difference. The flower bell seemed more translucent and the texture of the bloom was accentuated. I wondered how far I could go with this style of flower photography. 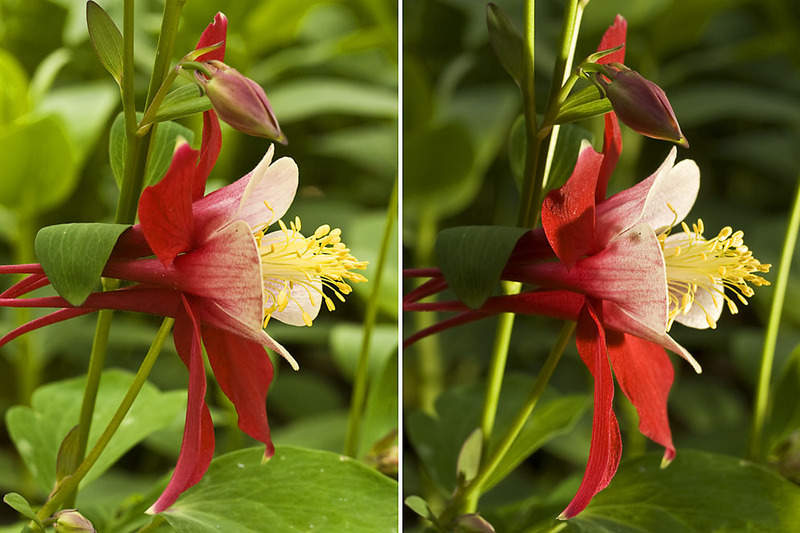 The columbine flower (aquilegia) on the left was lit by sunlight. In the image on the right I used a small off-camera flash — diffused with tissue paper —to highlight the bloom and reveal the texture of the petals. After this revelation I began to think about specialising in floral portraiture – in a studio, with controlled lighting. I favoured the studio approach because I wanted to avoid the difficulties of location shooting – limited camera positions, distracting backgrounds, fluctuating sunlight and windy weather. The prospect of working with artificial light didn’t worry me. My time in television production had involved a lot of interior filming so I was used to tungsten lighting. For me, the great advantage of continuous light is that you see exactly how the light affects the subject. The big disadvantage, especially when the subjects are delicate flowers, is the amount of heat produced by tungsten lamps. The last thing I wanted to do was fry my flowers!! A salesman of second-hand lighting equipment suggested I avoid hot lights by “light painting” flowers in a darkened studio. He was keen to sell me a device called a Broncolor Lightbrush. This device looked like an electric hair dryer, yet it produced continuous light. I asked to be locked in a dark room to see how it worked. The Lightbrush felt clumsy and lacked subtlety in its light output. 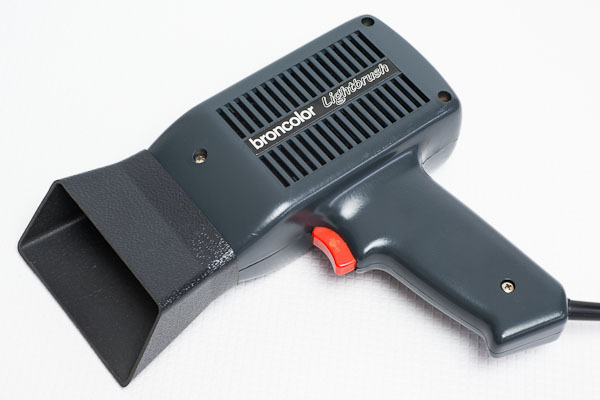 Then the salesman mentioned that the Lightbrush was a cheap version of a “Hosemaster”. I still had no idea how it worked and I struggled to find any images of the device. Then I stumbled on the Calumet online catalogue and found an itemised listing of the entire Hosemaster system – complete with pictures, descriptions and prices!! There was no way I could afford the thousands of dollars required to buy a new machine and the necessary accessories. The prohibitive cost of the Hosemaster system had forced some photographers to devise cheaper ways of light painting. 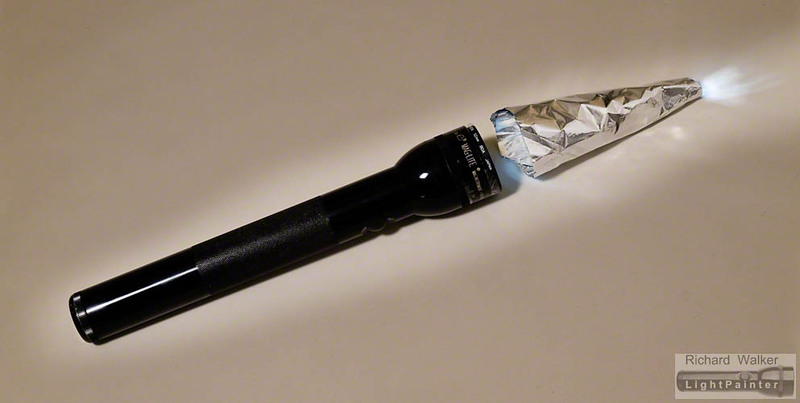 I found a blog with posted images that had been lit with a MagLite flashlight. So I decided to experiment. I bought a new MagLite and taped an 80A filter to the front lens to correct the colour temperature of the light. Then I attached a snoot of rolled aluminium foil. The metal foil snoot enabled me to narrow the light beam – like a miniature spotlight. A blue 80A filter was taped on the front of the flashlight. This corrected the “yellowness” of the torchlight because I was shooting a daylight film (Fuji Velvia). I loaded my 35mm camera with film and locked it on a tripod. Then I composed a shot of some tiger lilies in a vase on our dining table. It was night time. I turned off all the interior lights and began taking time exposures. I tried a variety of lighting techniques: first with an off-camera flash; then the MagLite; and finally a combination of the two. In the end, I was happiest with this frame, lit entirely by the MagLite. The MagLite was used as a top light shining down on the tiger lilies. 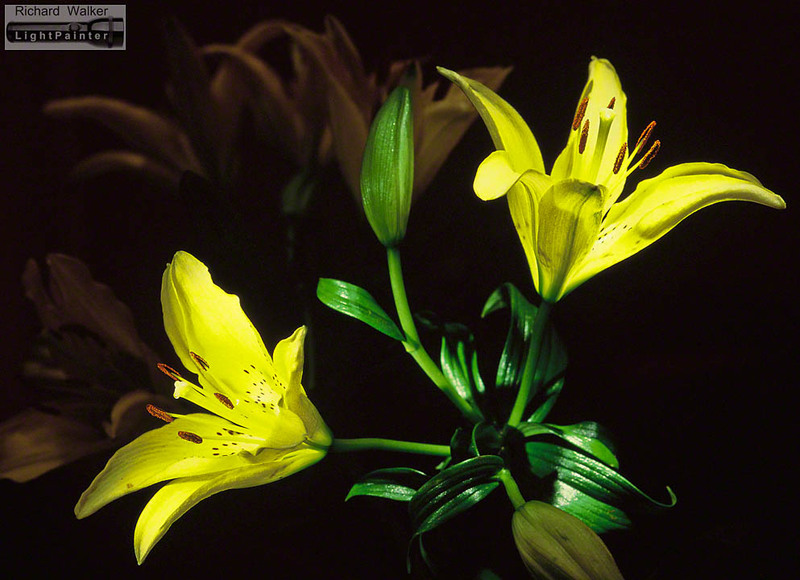 Shot on 135 Velvia with a Pentax 100mm Macro at f16, each foreground flower was lit for 10 seconds, each rear flower for 5 seconds. As I studied this frame I felt inspired by the endless possibilities of light painting! It was as though I had found a key that unlocked a door to a new and exciting world. A world I was keen to explore.